FILE - Air Force Lieutenant General Liu Shou-Jen introduces a map of Air Defense Identification Zone (ADIZ) in the East China Sea during a press conference in Taipei, Taiwan, Dec. 2, 2013. Taiwan said its military planes have made about 30 flights into a part of China's newly declared air defense zone, which overlaps a similar Taiwanese zone. 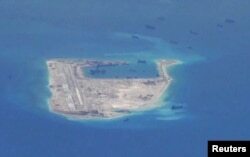 An air defense zone declared by Beijing, or any effort to stop civilian ship traffic, would raise the risk of conflict in the disputed South China Sea after years of calm, because either move would inconvenience day-to-day operations, scholars who follow the region say.